These are posies I did this week. They are all very different – one being just fynbos and the other mixes of indigenous and exotic. The back left is made up of Protea scolymacephala and Gladiolus carneus. The back right is the Rice Flower, Narcissus ‘Geranium’ and small arums. 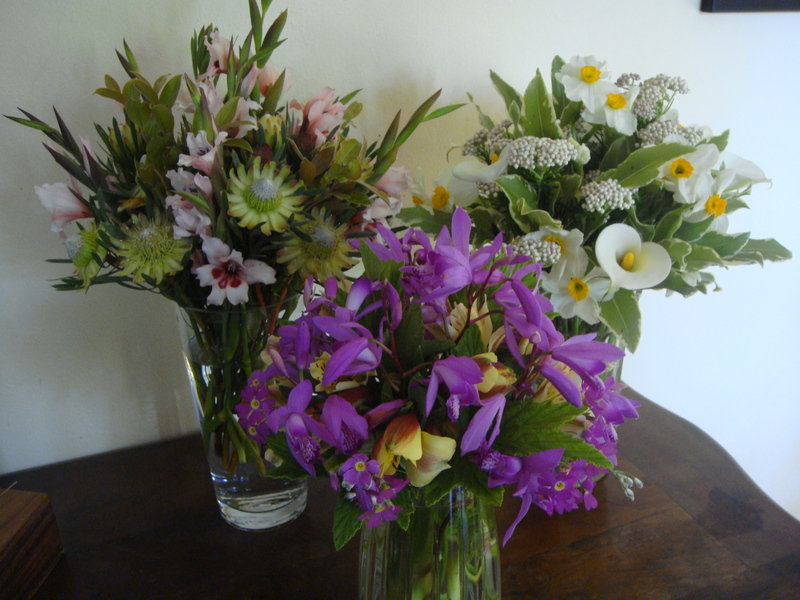 The front one is Alstroemerias, Bletilla striatas and primulas. More detailed photographs of the above posies are on my Picasa Photo Album. Sometimes we tend to think of winter as a dull month. These plants are flowering in the garden at the moment and they are just lovely! I am sure you will agree. Bletilla striata is a lovely dainty orchid that cuts well and grows in dappled shade. A Lavandula stoechas that looks lovely now.